Now that we’re challenging out preconceived ideas of a world map and the world itself, let’s shake it up further with this image. One glance at this image our brain registers it is a world map, but why does it leave us with an uneasy and unsatisfied feeling? A simple act of flipping the world Mercator map that we’re all familiar with, not only makes us look twice but also challenges our perception of the world and why we’ve come to accept a world map the way it is. I’m completely guilty of naively staring and accepting a world map as truth (Monmonier, 2014), studying borders, cities and routes, planning epic adventures… However, recently I’ve come to question if a seemingly innocent map of the world is really that innocent. Maps are ‘used by powerful elites to satisfy their agenda’ (Evans, 2015), and these agendas can influence ‘national pride, borders, conquests’ (Monmonier, 2014) and much more. 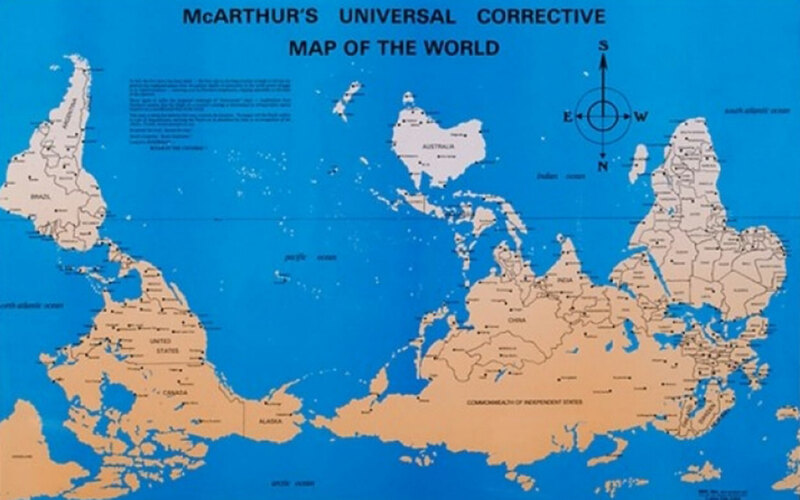 Criticisms of the Mercator world map include its Eurocentrism and disproportionality of countries, which both contribute to a skewed vision of the world. It presents some countries like the United Kingdom and the United State of America as large, dominant and important as they are positioned the top left and middle of the map whereas other countries like Indonesia, Japan and even continental Africa as smaller and less significant due to their positioning underneath America and Europe. 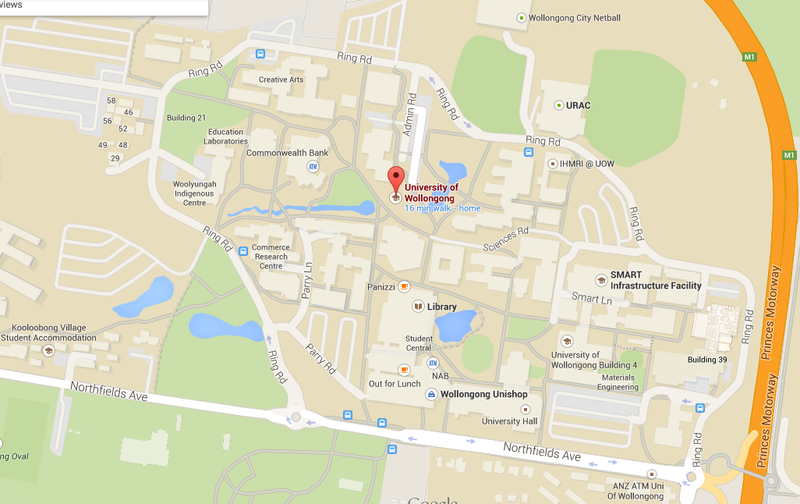 Even a simple case study using the University of Wollongong as seen on Google Maps, demonstrates the relationship between wealth, power and dominance. This is the University where I study and I encourage you to search your university or home town to see which features are most prominent and question why that is so. Why is Panizzi and Out for Lunch but not the Yard or Rush? Why is the Materials Engineering, building 4 shown but not the Communications Centre or the Law Humanities and Arts building not? ‘We map what we want to see, not what is there’ (Evans, 2015). On a more political note, the conflict between Israel and Palestine clearly demonstrates the use of maps to not only own and control land, but also relates to culture, history and it’s people being erased as well. The decrease of Palestinian land and growth of Israeli land is not purely about land ownership but is directly related colonial issues and political control when the British handed the land to Israel (M.S, 2010). 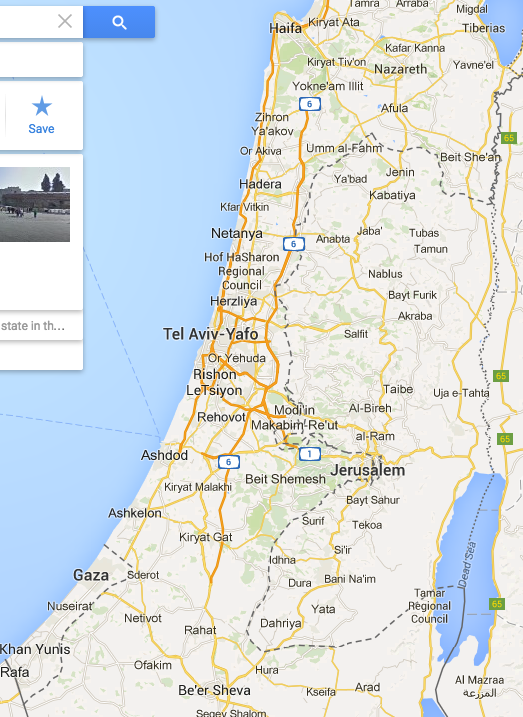 In 2013, Google Maps changed ‘Palestinian territories’ to ‘Palestine,’ however, when typing ‘Palestine’ into Google Maps in 2015, this is the image produced. There is no distinct area that is labelled as ‘Palestine,’ which raises the question of political power and influence a company like Google Maps has over political control (Groll, 2013). It is important to be aware of maps ability to lie to us and distort our image of the world, countries, ethnicities, nature and people and it is up to us to be vigilant in seeking answers. I always enjoy reading your blog :). Your BCM232 posts have been my favourite to read from the subject. It’s evident you always do a stack of independent research, instead of just regurgitate what you heard in the lectures or pulled from the recommended readings. It shows a real passion and interest in the subject (and an interest in obtaining HDs, not just Ps!!) and I find it refreshing. I’m as guilty as you of ‘naively staring and accepting a world map as truth’. In this week, the subject figuratively and literally turned the world as I knew it upside-down. I’ve enjoyed learning more about the counter-mapping culture and the political propaganda of maps in the weeks following (much to the detriment of the other learning I was supposed to be doing…ooops). As a UOW student, I also appreciate your mention of the campus map, but with your audience undoubtedly a global one by this stage, further details/descriptions about the campus wouldn’t have gone astray here. Again, great work and thank you for being an engaging and engaged blogger and student. Thank you so much Amy for your detailed and helpful feedback. Your constructive criticism has definitely been taken on board and I’ll be sure to revisit my post. Also, thank you for the encouragement to reach for HD’s! Palestine is an issue that is increasingly interesting me and something I definitely don’t know enough about which definitely inspired my research! I must return the compliment as well as I have thoroughly enjoyed reading your posts and look forward to continuing! Thank you so much Eryn for your comment. The distortion of maps is not something I’ve ever really thought about prior to studying it through this subject however now that I’m aware, I can’t not notice it! It’s a bit crazy to think how embedded our global perceptions are in our every day lives hey? This was a very interesting blog post. Your stance on mapping and its close relationship with power and wealth is something I agree with and by including the examples from university I think you really clearly highlight this. Do you think that if you were to look at a different university, say USYD for example, the map would have more features? Do we not just map around power and wealth, but based on prestige too? That would be an interesting perspective to look at! Another reader actually mentioned a comparison similar to this. It would be an interesting thing to investigate and perhaps at a later date, is something I could explore. I do think that power, prestige and reputation do play a part in representation because of economic influence.